Sugar Ray Leonard has an interesting history on this show. He took a split decision from Oscar De La Hoya on July 3 of last year, then he beat Floyd Mayweather, also by split decision, on September 11. But those were guys who could match him shot for shot style-wise. 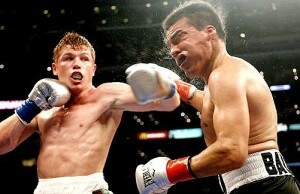 So what happens when we throw him in against Manny Pacquiao? Does it become like the first Roberto Duran fight? Or does Pac-Man go the way of Davey Boy Green, from which fight we’ve put Leonard in the time machine? Manny’s always struggled with counter punchers, but we’re putting a much fresher Pacquiao from the last knockout win of his professional career, against Miguel Cotto in 2009. Your co-feature? It’s the granite-chinned Joey Maxim, at light heavyweight, in an old-vs-new battle against today’s Adonis Stevenson (technically, the Adonis who fought Tommy Karpency, but no point using a time machine to move a guy only a few months.) Maxim’s in off a win over a guy who was the prototype of a Stevenson-type fighter, the big-punching Bob Murphy, in 1951. Will the irresistible force crack the immovable object? Or will an old-school fighter who could throw his weight around like a heavyweight prevail? Stevenson has built a career on stopping people with big, monstrous straight left hands from the southpaw stance. Maxim built his career on taking the best that anyone could throw at him; he lost 29 pro fights, but only one (in 1943, against Curtis Sheppard, a loss Maxim avenged in his next fight) by knockout. Maxim was also a frequent guest of the heavyweight division; only when his 175-pound title was at stake did he ever bother to make that weight. Stevenson is, at his heart and soul, a super middleweight. 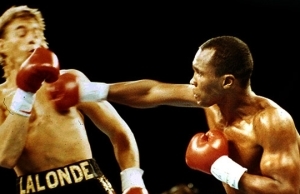 Stevenson never quite mastered the art of using the jab to keep a pressure fighter at bay; his go-to strategy on such an occasion has always been to try and create distance to land the big left hand. Meanwhile, Maxim frequently relied on tight, short punches on the inside, pounding the body and mixing it up in close, relying upon his stamina and the iron nature of his head to withstand the attack. Let Adonis find his rhythm, he’ll beat your face in; force him square, to where he can’t get leverage in the southpaw stance, and you can slow him down. Maxim chose the latter tack and worked the midsection of “Superman” like a side of beef in a Rocky movie. Don’t let Maxim’s lack of knockouts fool you. He was the kind of guy for whom the phrase “an accumulation of punches” was practically tailor-made. He may not have had one-punch power, but he could wear you down, and Stevenson looked frankly lost when Maxim was able to work his way inside. Stevenson tried to time Maxim, but Joey’s superior hand speed would just as often flip out a few jabs to take away the rhythm of the Montreal-based fighter. 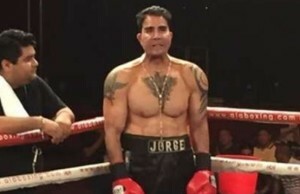 This was a clinic, the sort of fight that “they don’t make ’em like they used to” old-timers point to when they want people to believe that the art of actual boxing is dying in favor of a cheap slugfest. Stevenson mounted a decent comeback and had a good round here, based largely off landing his first big punch of the fight, a left hand set up by a sneaky little right hook. Maxim staggered back a couple of steps, but Stevenson was unable to mount a more effective offensive despite trying his best to chase Maxim back to the ropes. We’re in a big ring tonight, a concession to Leonard’s people after giving him a phone booth for that Mayweather fight; given 24 feet in which to work, Maxim had plenty of room to escape; had the ring been smaller, we may have seen a different result. Battered but far from bent, much less broken, Maxim went back to his corner with his lead halved, 2-1 in rounds. Trouble was, when Stevenson saw that he couldn’t just steamroll Maxim, something cracked in him mentally. He wanted the big knockout, but even after he landed another decent shot which didn’t even slow Maxim down, it seemed to sap his will. Maxim began to control the distance, once again turning this fight into a chase-and-pound affair, and Stevenson was never much for running. Round after round, Maxim kept working that body, mixing in the occasional uppercut to tag the chin of Stevenson and further sap his will to get the job done. Stevenson’s body ached, as another trait of Maxim made itself known, specifically Joey’s impressive accuracy level. He was a guy who didn’t waste punches, and he would waste no punches here. Shot after shot, short, tight, too fast to counter, too painful to shrug off, continued to ruin the midsection of a man who got the look in his eyes like the fight had gone out of him. A chiseled side of prime beef had been beaten into Beefaroni. It became something of an open question whether this would go the distance. Finally, a sharp left hook right to the liver was the final straw halfway through the eleventh round. Desperately behind on points, his ability to punch hampered by the excruciating agony of trying to rotate his midsection in order to put his body into it, Stevenson went down to a knee. As referee Arthur Mercante Sr. counted, all in attendance wondered if perhaps we were seeing Stevenson’s very own “no mas” moment. He rose at nine. But his listless inability to mount any sort of attack meant that he was merely surviving on grit, determination, and a Balboa-esque need to go the distance. Maxim attacked. Stevenson survived. Three minutes went by…and we go to the cards. The first thing you notice about these two guys is that they’re fighting a range war; Leonard stands 5’10” with a 74-inch reach, while Pacquiao is 5’5″ with a 67-inch reach. Manny’s shorter than Roberto Duran. You know who else he gave up a bunch of height and reach to? Floyd Joy Mayweather Junior, that’s who. What happened is that Sugar Ray fought the range war he knew he’d need to in order to win this fight. He had his big ring. He had his small opponent. He danced around potshotting like Ali in the second Sonny Liston fight. From angles, he popped the jab, worked the hook, and took away Manny’s attack with snappy counter shots. Manny couldn’t get his feet under him; Sugar Ray was boxing literal circles around him, and this one looked like a disaster in the making. Manny had a bit more success forcing his way forward, but every time he got inside and managed to land a couple of good shots, he’d eaten two jabs and a hook to get there. It was looking a bit like that Mayweather fight for Pacquiao. He couldn’t beat a counter-puncher in his day, and he was getting countered to hell and back. Angelo Dundee packed into that time machine with his charge, and he knew exactly what kind of fighter was in front of his guy. Leonard had prepared accordingly, a man who, if the moment was enough to stoke his ego, could rise to the level of his very best. There would be no taking rounds off; there would be no lack of conditioning to hold him back. This was prime Leonard on prime form. Manny, continuing to try to press, could do nothing to slow Sugar Ray down. 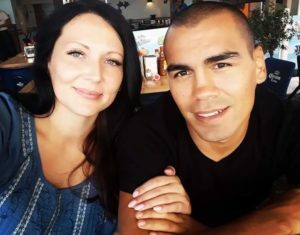 He opened up, trying to land a big shot…and walked right into a straight right hand, sending him flat on his face in exactly the same fashion as the one Juan Manuel Marquez landed on him in their fourth and final fight. This would be no technical masterpiece. This was more like the Davey Boy Smith fight for Ray Leonard, a massive outclassing punctuated by a short night. Pacquiao has a win at flyweight over Michael Carbajal on this show. 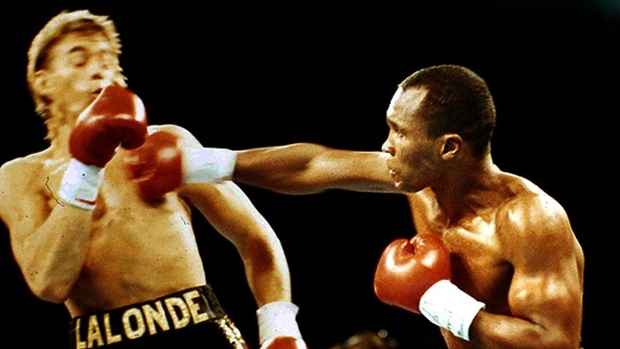 He’s lost to Salvador Sanchez, Roberto Duran…and now Sugar Ray Leonard, dropping him to 1-3. Take a lightweight Pernell Whitaker, mix in a dash of Esteban De Jesus (in via time machine from handing Roberto Duran his first loss), and stir in a California arena for twelve rounds, and what do you get? You get next week’s main event. Your co-feature? How about a couple of guys we haven’t seen on the program yet? Barry McGuigan takes on Jeff Fenech in a featherweight contest. Lest we be accused of overuse of our old standards around here, let’s stir in something new and keep it fresh, shall we? It all happens every Saturday, right here on The Boxing Tribune. Thanks for reading!